← Is Cool the Rule for CCDs? Suppose that you have a tiny fluorescent object, such as a 10nm-diameter fluorescent bead or even a single fluorescent molecule, and you try to observe it under a fluorescence microscope. Provided that the object is bright enough, even though it is well below the resolution limit of your microscope you can still see the object; but it will appear larger than it really is. 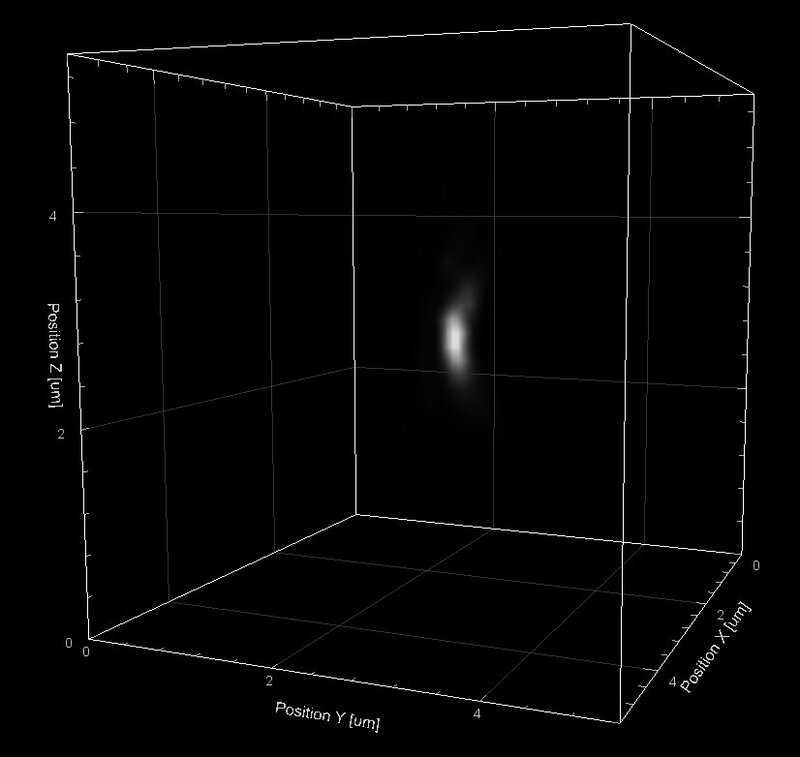 Diffraction of light, which determines the microscope’s resolution limit, blurs out any point-like object to a certain minimal size and shape called the Point Spread Function (PSF). The PSF, then, is the three-dimensional image of a point-like object under the microscope. The PSF is usually taller than it is wide (like an American football standing on its tip), because optical microscopes have worse resolution in the depth direction than in the lateral direction. Shorter wavelengths of light (such as blue light, 450nm) result in a smaller PSF, while longer wavelengths (such as red light, 650nm) result in a larger PSF and therefore worse resolution. Also, the Numerical Aperture (NA) of the objective lens that you use affects the size and shape of the PSF: a high-NA objective gives you a nice small PSF and therefore better resolution. Surprisingly, the magnification of the objective lens does not affect the PSF – only the NA and wavelength matter. You can use beads to measure Point Spread Functions for the objective lenses on your microscope to determine the resolution of each lens and also to see what condition each lens is in: the PSF of a damaged objective lens is often large and possibly skewed in one direction or another. Sometimes, a real specimen does indeed have single point-like fluorescent objects nicely separated from each other. For example, cancer researchers studying the complicated process of DNA repair often irradiate cells and look to see what proteins localize on punctate sites of double strand breaks. These nuclear foci are small enough that you are actually observing the microscope’s PSF when you image them. In many cases, however, your specimen is a complicated arrangement of closely spaced fluorophores, and the PSF is not apparent in your images. Nevertheless the PSF is hard at work, blurring out every fluorescent structure in your specimen as if tracing out the fine details with a fat paint brush. It’s no accident that the symbol for convolution looks like a multiplication, since the two operators are related. We don’t know what the actual Specimen looks like, but we record its Image in the microscope, and we can also record the PSF. An operation called deconvolution reverses the effect of the PSF on the specimen, much like the division operator reverses the effect of a multiplication. Practically speaking, we can never fully know what the specimen looks like, but by using iterative deconvolution algorithms we can remove some of the PSF’s blurring influence, particularly in the depth direction where the blur is worst. 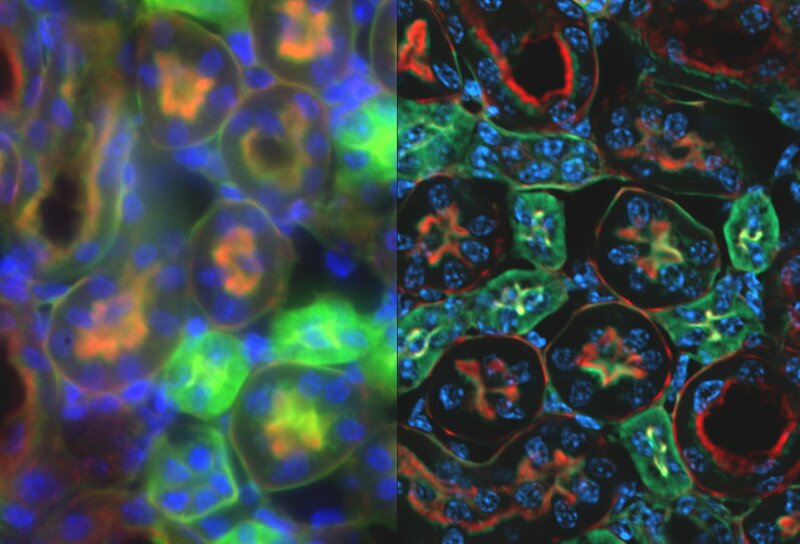 Widefield (left) versus Deconvolved (right) images of a mouse kidney slice, imaged on a Zeiss AxioObserver with a 40x/0.85NA objective lens.